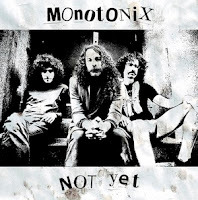 Listening to a Monotonix CD is a little bit like trying to watch a movie using the radio. Sure, you may get the idea of what's going on, but there's something missing. If you've never actually seem the movie in question, you might not even know what's going on. It's the same with Monotonix; if you've never seen the band live before, you probably don't understand how truly great this record is. On the surface, Not Yet is a gritty and grungy record with slurry vocals and an "in your face" attitude. What makes it amazing is that this accurately describes the feeling of Monotonix in a live setting. Though it might be impossible to truly feel what it's like when the bearded lead singer all of sudden pops up right in front of you, stripped nearly naked while singing in your ear. It's certainly tough to record the feeling of a drum kit being passed over your head (drummer included). But put on some headphones and listen to this album, and it's about the closest you're going to get. The band could have tried to grab themselves in a live setting, but instead they recorded their messy sound with amazing clarity, capturing every dirty moment. They pulled off a gem here by invoking the spirit of their live show even if it happened without the method.